Our laboratory’s mission is to contribute to realization of sustainable society co-existent with natural resources and harmonious with Earth environment and advanced utilization of strata storage functions. For this, interdisciplinary researches are ongoing about distribution modeling of mineral, water, and energy resources using Earth measurement methods, mathematical geology, and geochemistry; clarification of chemical properties and flow phenomena of crustal gasses and fluids; and advanced estimation of geological, thermal, and physical structures of the crust. Static and dynamic geological information over wide range about geological structure, rock/mineral types, physical/chemical properties, and crustal deformation is indispensable to clarify mineral and energy resources distributions. To meet this requirement, we are developing remote sensing methods to estimate geological and property distributions through reflectance and emissivity spectra and scattering physics of electromagnetic waves; characterize fracture system; and extract precisely topographic changes by interferometric SAR. 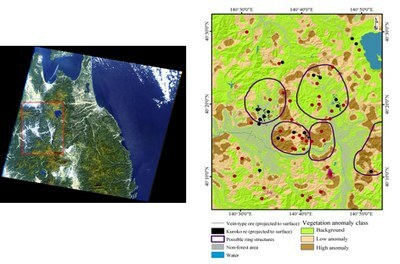 High potential zones of mineral deposit (colored brown) suggested from variation coefficient of vegetation index, termed VIGS with location of actual mines in the kuroko-deposits area, Hokuroku district, northern Akita prefecture. 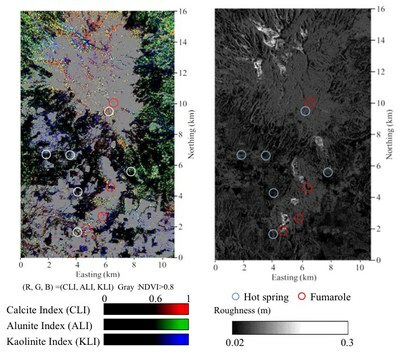 Mineral-index distribution using ASTER image data (left) and surface-roughness distribution calculated from ALOS PALSAR polarimetry data (right) for the Wayang Wingu geothermal area, Indonesia. Understanding of fluid flow in earth crust is important to utilize various earth resources and to address environmental issues. As examples, groundwater management based on recharge, flow, discharge conditions of groundwater contributes to sustainable utilization of the valuable water resource. Flow regime of geothermal fluids must be estimated for efficient exploration and sustainable use of geothermal energy. In our laboratory, techniques that enables to estimate flow regime of earth crustal fluid have been developed by integrating geochemical indices such as chemical and isotopic compositions, hydrogeological modeling using geostatistics, and simulations of groundwater flow and mass transport. Hydrogeological model of Kyoto Basin, developed using geostatistics (left) and results of groundwater flow simulation using the hydrogeological model (right). Tritium concentration in groundwater at 1953 estimated from groundwater flow and mass transport simulations. We develop geophysical technology for imaging crustal structure using electric and magnetic field, interpreted jointly with geological information obtained by remote sensing, and with geochemical information. Geophysical exploration technology with higher resolution and accuracy is required for active fault survey, exploration of geothermal resource (hydrothermal reservoir), and off-shore exploration of sub-seafloor resources; oil, gas, gas hydrate, submarine hydrothermal deposit, and so on. 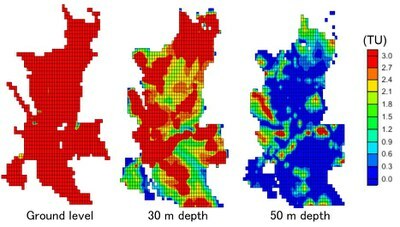 We develop novel data-analysis methods and numerical modeling schemes of subsurface structure based on computer technology, and seek advanced technologies to visualize the detailed underground world while combining with the geological structure and other information. New hardware for observations is also developed and actually used on the ocean floor for resource exploration. Conceptual drawing of controlled-source electromagnetic survey. Submarine resistivity structure in an off-Okinawa hydrothermal active area. This image has been successfully obtained by newly developed hardware and geophysical inversion. Conductive zones, C1-C3, suggest existence of subsurface hydrothermal fluid and buried hydrothermal deposits. Comprehensive clarification of geological and property structures from mm to km scales is important to precise potential mapping and development of mineral and energy resources in promising areas. For this, we are integrating three-dimensional modeling using geostatistics and various numerical simulations with field measurements and applying it to specification of deposit generation mechanism and prediction of environmental effect by the resource development. Three-dimensional fracture modeling in the Tono granite area (Gifu prefecture) using the developed geostatistical simulation method, GEOFRAC. 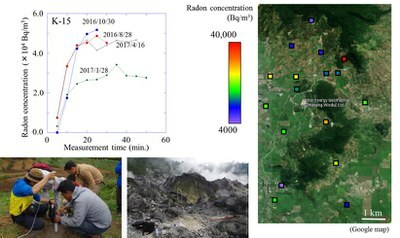 Radon survey in soil gas using shallow boreholes made by our BAGUS project and an example of measured concentrations in the Wayang Windu geothermal area, Indonesia.